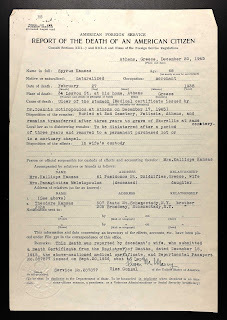 Did your ancestor travel overseas for work, missionary work, U.S. government work? Was a child of an American citizen born overseas? This occurred frequently with customary long overseas visits. The Department of State records, various records of death notices of US citizens abroad should be scoured for your elusive ancestor. Don’t dismiss these records as only for those who were naturalized USA citizens and returned to their native land to visit family. 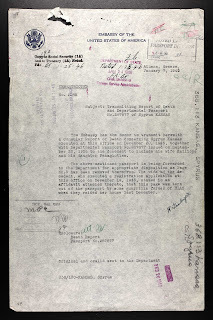 Vacationers fell sick, were victims of violence, automobile accidents, or were imprisoned, etc. These records also included deaths that occurred in Canada and the Americas. In addition to providing genealogical data of family members and kinship, often a passport number is provided. 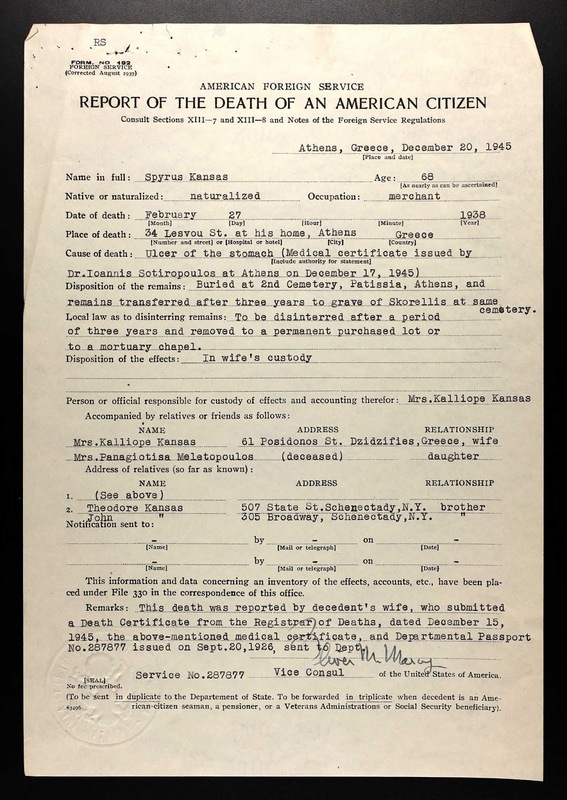 In the case of Spyrus Kansas, Greek born, but naturalized citizen of the USA, the names and addresses of his wife and siblings are provided, along with his passport number and his burial (and re-interment) information with the cause of death. It even gives information on the family home being attacked by guerilla forces while in Greece. Women were often naturalized by marriage; and travelled on a joint passport. 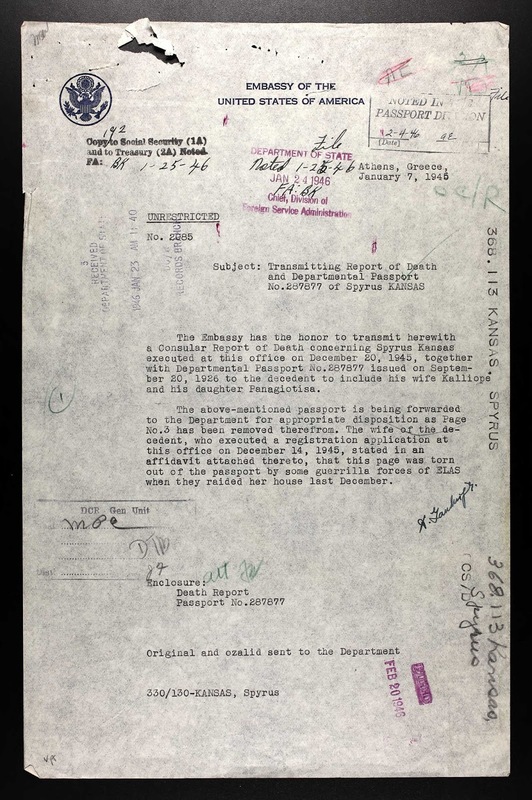 See Passports Applications for Genealogy. 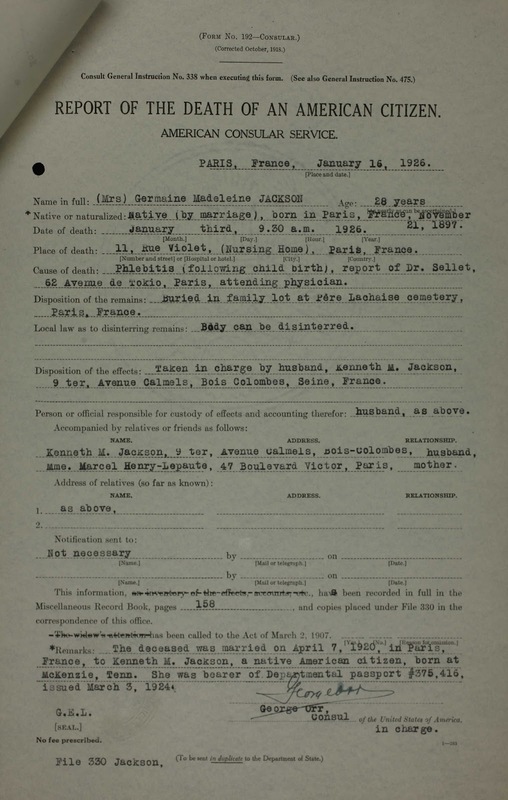 In doing so, American citizens (by marriage) like that of Germaine Jackson’s death states she was a [USA] native by marriage, but born in Paris. The good news for the researcher is that for clarification, her marriage date, and address of her French family and origin are provided. It’s no surprise that many died at sea. There are 333 records of Titanic casualties; limited to the bodies found. Obviously sea voyage continued to the destination, and the deaths were reported to the Dept. of State, upon arrival as was William Morris’s death. Morris of New York was traveling to Brussels in 1903. 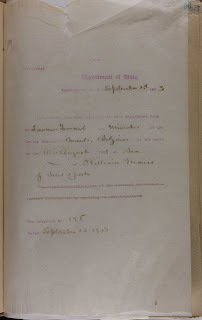 If your ancestor served the USA on an assigned foreign diplomatic or other government post, records can be located in Record Group (RG) 84: Foreign Service Post Records of the US Department of State. 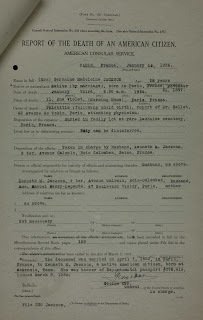 Textural records of the death (plus births and marriages) from 1788-1962 of US citizens may be found in the Records of Diplomatic Posts (RG 84.2) and Records of Consular Posts, RG84.3.